Heal Yourself by regularly cleansing and balancing the your Chakras. In brief, Chakras are the Multi-Dimensional portals within our body. They govern our life by controlling our physical, emotional, mental and Spiritual Bodies. Balanced Chakras bring peace and harmony within ourselves, as well as in our physical reality. 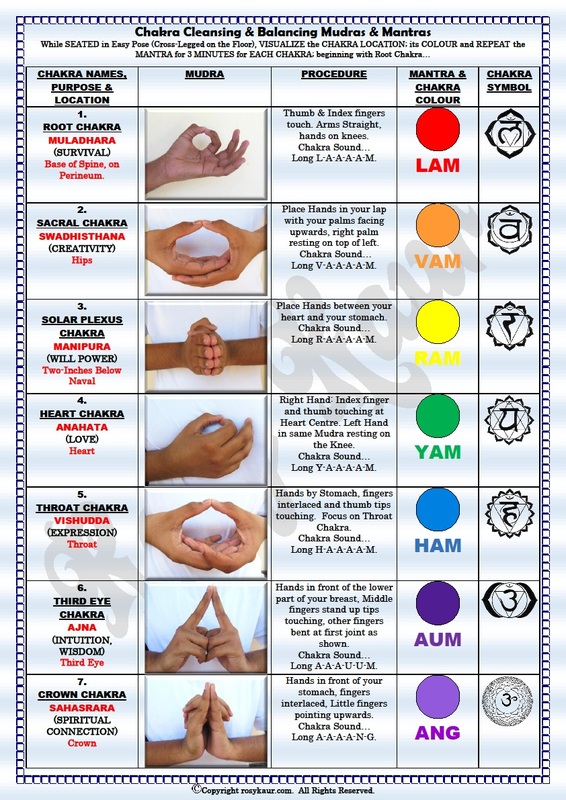 The Chart below shows the Chakra locations, the Mudras that you use during the balancing exercise, the Corresponding Colour for the Chakras and the Mantras. Love & Peace to all! Categories: Reiki, Yoga & Meditation | Tags: Chakra Balancing, Chakra Cleansing, Chakras, Healing, Mantras, Mudras, Reiki, Seven Chakras, Yoga | Permalink. HOW TO INITIATE A REIKI SESSION? IN A REIKI SESSION, WHAT IS AN INTENTION AND WHAT WOULD BE THE BEST INTENTION? WHAT IS A REIKI SHIELD AND HOW DOES A REIKI MASTER MAKE HIS/HER SHIELD? HOW DO DISTANT HEALING OR DISTANT ATTUNEMENT TAKE PLACE? HOW MANY LEVELS OF REIKI ARE THERE, AND WHAT CAN EACH LEVEL TEACH? PLEASE LIKE MY PAGE. THANK U!